During the first week of school, I give my seniors a questionnaire that, among other things, asks them to reflect on their writing strengths and challenges. One particular question asks students to discuss how they feel when they are given an in-class essay to write, and each time I ask, the overwhelming response is always “anxious” followed closely by dread. Worse, many of them describe their physical reactions to writing assignments with symptoms that are tantamount to anxiety attacks: an inability to breathe, clammy hands, headaches, racing heart beats, scattered or blank thoughts, blurred or tunnel vision, difficulty sitting still, nausea. When I ask students to consider why they feel this way when given a writing task, many of them cite failure and judgment as the chief reasons for their anxiety. As every writer knows, there’s an element of exposure and vulnerability when writing for an audience that can be intimidating even for the most seasoned of us, but which for novice writers can easily become debilitating. Their struggle is real and rather than risk failure or a blow to their self-confidence, some students simply will choose not to write anything, feeling that their choice to fail an assignment by not doing it is preferable to pouring themselves into their writing only to have all of their errors paraded in red ink across their paper (this, by the way, is true for all assignments not just essays). There are, however, several techniques I use to reduce my students’ anxiety about writing. Some of them require only small changes whereas others require more substantial efforts on the part of teachers to alter their own and their students’ mindsets. The easiest change I make to redefine students’ perception of writing is to tell them they are receiving a “writing opportunity” rather than an “essay exam” and, because I believe grades aren’t meant to be punitive but rather a measure of learning progress, I reassure them that every in-class timed essay is eligible for a full credit rewrite. This simple rephrase alters students’ attitudes and creates a learning space for performance rather than a fear of judgment that can cause anxiety and stress. Another modification a teacher can make is to throw away all the red grading pens. Studies show that scoring an essay in red ink wreaks psychological havoc with both the grader and the graded. Instead of using red ink, I comment on student writing using green, purple, black, or blue. Not only do these colors not carry the stigma that red does (The Scarlet Letter, anyone? ), but also students are more likely to read and internalize the comments an instructor makes on their paper when they feel less threatened by them. While we are on the subject of comments, another technique I use is to minimize the number of grammatical corrections I make. For example, rather than mark every grammatical or mechanical error a student makes in an essay, I focus my energies on the first paragraph or two since chances are students make the same comma errors throughout the entire essay that they make in the first two paragraphs. Therefore, I mark the corrections, provide a brief explanation, and in my summative comment at the end, I let them know they have several comma errors in their essay that need to be corrected in their rewrite. If they are particularly pervasive, then I ask students to attend a short tutorial so I can show them additional errors and help them learn to recognize them. If the error tends to be something the entire class is doing, I do a mini-lesson using student writing on the day I hand back essays. In addition, while I may alert students to the need to revise a sentence or replace a misused word, generally speaking, I restrict longer comments to particular compositional elements I want students to practice, keeping my margin comments positive (“nice,” “good point,” “excellent”) and interrogative to engage their content and push them toward deeper inquiry and critical thinking (“what does this mean for ___,” “how might this ___,” “why is this ___”). I also provide a longer summative statement at the end that first informs students of their strengths in the essay (every essay has something it did well—find it!) followed by one or two areas they should focus on improving in their rewrites and in subsequent essays. Likewise, a mantra followed by The College Board and instilled in every Reader throughout the June scoring season is to “Reward students for what they do well.” This is good advice and definitely makes any teacher’s grading job easier since she is not on a seek-and-destroy mission to deduct points for errors but instead is awarding points for student writing successes. It seems rather minor, but this simple mindset change completely revolutionized the way I graded when I first started teaching AP English. Certainly I found that it helped me keep my sanity, but more importantly, my students’ writing improved at rates far faster than I could have imagined. Help students identify the contextual information (“In literary works, cruelty often functions as a crucial motivation or a major social or political factor”), locate the big issue (“acts of cruelty are important to the theme”), and decipher the task at hand (analyze “how cruelty functions in the work” and “what [it] reveals about the perpetrator and/or victim”). Aside from not understanding the writing task, students simply may not know how to organize their thoughts into a coherent argument. Thus, it is equally as important to teach students how to brainstorm and prewrite before beginning their essays. Early in the year, I often see students staring into space for 20 minutes trying to map out their essays in their minds, and then putting pen to paper and frantically scratching out a feeble argument in the remaining time. Interestingly, students who do attempt prewriting often go about it ineffectively by writing a rough draft using complete sentences then copying those sentences onto the paper they turn in to be scored. Rather than allow students to spin their wheels in vain, teach students to “brain-dump” their ideas using short phrases, words, symbols, or abbreviations. Make it clear that their prewriting is meant only for their eyes so it needs only make sense to them! I model this stage for them on the whiteboard so they see the “clumsiness” of thinking, and then once I have jotted down as many ideas as I can come up with in a predetermined amount of time, I model organization by showing them how to eliminate weaker ideas (not every idea will make it into the essay—and probably shouldn’t either), how to categorize ideas according to the task, and how to pull it all together to formulate an argument, or thesis. When students see a physical representation of how I think, categorize, and develop my ideas, as well as the challenges I encounter during the process, they are freed from their misconceptions about what “real” writing looks like and prewriting becomes a natural part of their own writing practices. As they become more adept at prewriting, I have them collaborate as a class by doing the prewriting on the board themselves. This gives them the opportunity to share ideas, as well as improve their critical thinking by allowing them multiple views and ways of interpreting a passage. Another crucial practice—and likely the most intimidating for teachers for the same reason it is intimidating to students—is to model essay writing from start to finish. Two methods I use are model-aloud and simultaneous writing. In model-aloud writing, I project a Word document on my whiteboard and use my wireless keyboard and mouse to manipulate the document from the front of the room. I start by decoding the prompt and brainstorming my ideas by hand to the side of the projected image, talking students through my thinking and the questions I have as I am working, and engaging their ideas and suggestions as I work. Then, using the prewriting I can still see on the side, I begin typing my essay into my Word document. Students listen to me as I struggle to find the word I want to use, watch me type and rethink ideas, and understand how and when I use evidence to support my argument. The value of this exercise isn’t in the finished product but in the process they see as I work toward a completed draft. Students often believe that writing just “happens” perfectly the first time; however, when they witness my struggles, challenges, excitement, and revisions, they begin to understand that writing is organic and fluid, thereby alleviating some of the anxiety they experience when they write. Of course, really astute students will eventually argue that writing is easier for the teacher because she chooses the prompt ahead of time. To counter this argument, I challenge my students to collaborate to write a fresh prompt for me to write. Besides simply stymying their campaign against writing, it shows them that I will never ask them to do something I am unwilling to do myself. One of my favorite prompts and responses, however, did not come from my students but from another teacher’s students who were practicing our state’s end-of-course writing assessment. His students thought they would have some fun by giving him a prompt that references a popular pop song: “Write an essay explaining why your milkshake can’t bring all the boys to the yard.” The ensuing model-aloud certainly produced much laughter but also provided valuable lessons about interpretation, the use of evidence, and the joy of writing. You can read the full essay here (thank you, Peter, for being such a great sport!). 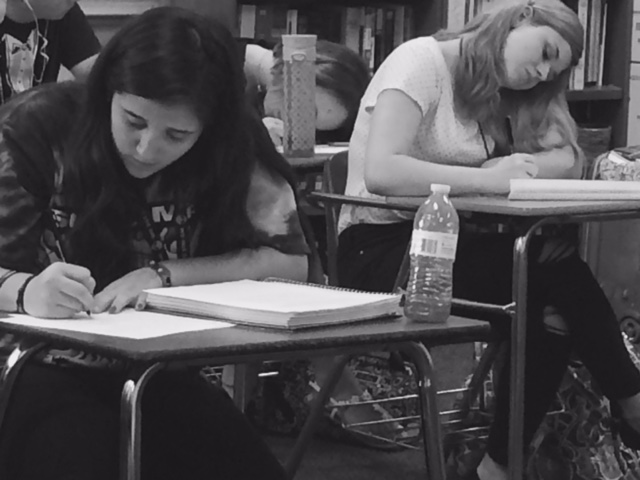 In simultaneous writing, I write my own essay quietly while students write theirs. Afterward, I discuss with students the challenges they encountered while writing and share my own travails with them. When I hand back scored essays, I use my essay as well as some of their essays as models for understanding strengths, weaknesses, and areas for improvement. They see my scratch-outs, my revisions, my arrows and insertions, and the general messiness of thinking and writing. This functions not only to provide a model for analytical writing but also further alleviates their anxiety by freeing them from the confines of self-imposed perfection. Model writing is one of my favorite teaching strategies because it unlocks the power of writing as a learning tool. 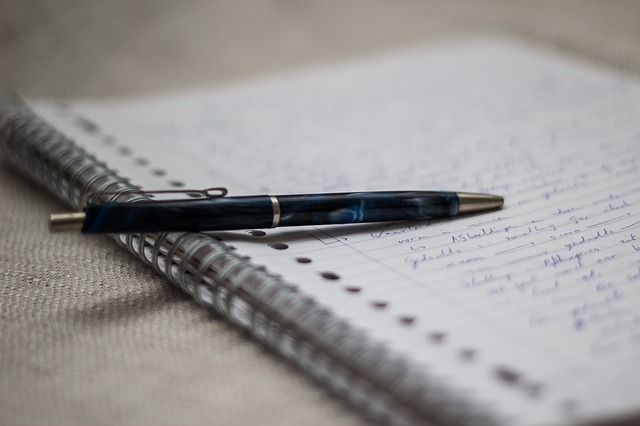 Writing is a very personal activity as it forces one to articulate his or her thoughts. As we know, our thoughts can sometimes be a scary place to explore, but the mere act of exposing ourselves to our students can create a rapport that cultivates a safe environment for students to take learning risks that ultimately lead to deeper understanding, longer retention, and a joy in learning that is sometimes lost in rote memorization and state assessment pressures. Dethroning the imperial essay redefines the writing process for students and replaces their writing anxiety with learning excitement. First, I want to appreciate your use of “their struggle is real” (whether intentional or not). You’re definitely a high school teacher. I say it all the time without realizing it. Sociolinguistics to the max. Fantastic practices regarding grammar feedback. I find that’s where I sometimes struggle to give effective feedback to the whole group. I will often turn my pass-back days into mini grammar lessons when I find a repeated error across multiple essays, and that has been mostly helpful. I find that also giving summative responses explaining how I experienced their writing as a whole adds another helpful layer to feedback. And while it may not be the most time-efficient grading method, it provides them with a good view into their audience’s experience and makes their essay writing, which can be anxiety-filled, more meaningful. The downfall of that method is that some students won’t take the time to actually read my commentary—others, however, have expressed how much they love to have that kind of feedback, so I continue to use employ that. Thanks for sharing and giving me an opportunity to reflect on my students’ writing anxieties, the writing process I teach, and my own model writing. Certainly food for thought! Thanks for commenting! I also find some students don’t take time read the comments, at least at first, but even my most reluctant writers or obstinate students have expressed appreciation for the summative comments eventually. Part of this is because I spend more time telling them what they’ve done well and then telling them how they can make those parts even better. When they realize they aren’t being criticized and that their efforts are being praised, they usually begin trying to incorporate those suggestions. Perhaps more importantly, they begin engaging in class discussion because they feel validated and empowered. It changes the entire classroom dynamic and students who refuse to write at the beginning of the year are often excited to offer their opinions, both written and orally, by the end of the year. It’s the first time many experience success and it’s so wonderful to watch them grow into learners–by far the best part of teaching! If you have other suggestions, I’d love to hear them. I’m always looking for fresh strategies to use!